Two (2) - 3" x 5" (Hand Warmer Sized) Reusable Instant Heat Packs. One (1) - 5" x 9" Reusable Instant Heat Pack with bendable joints for multipurpose use and application. One (1) - 6" x 18" Neck and Shoulder Reusable Instant Heat Pack. Recommended for in Home Use, Medical Offices and Clinics, Convalescent Hospitals, Hospices, or Other Healthcare Providers. Two (2) - 3" x 5" Hand Warmer Reusable Instant Heat Packs. One (1) - 6" x 18" Neck & Shoulder Reusable Instant Heat Pack. One (1) - 8" x 8" Medium Back Reusable Instant Heat Pack. One (1) - 4" x 10" Reusable Instant Heat Pack with bendable joints for multipurpose use and application. One (1) - Face Mask Reusable Instant Heat Pack for Headaches, Sinus pain, Migraines, or Facials. Four (4) - 3" x 5" Hand Sized (Hot Rocks) Reusable Instant Heat Packs. One (1) - 8" x 12" Large Back Reusable Instant Heat Pack. Four (4) - 3" x 5" Hand Warmer size Reusable Instant Heat Packs. One (1) - 5” x 9” Medium Sized Reusable Instant Heat Pack for hand muff or anywhere else. 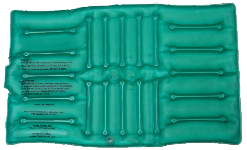 One (1) - 8" x 12" Large Back Reusable Instant Heat Pack for use in your sleeping bag, rectangular hot seat or as a foot warmer. Four (4) - 3"x 5" (Hand Warmer sized) Reusable Instant Heat Packs. Used to warm hands, and other body areas to help prevent hypothermia. One (1) - 12"x 20" Full Back Reusable Instant Heat Pack for full body warming / cooling. Two (2) - 8”x 12” Large Back Reusable Instant Heat Packs for one or two people. Use by rescue teams, cold weather hikers, truckers, anyone traveling during cold climate / hazardous weather conditions or general comfort. Save with Heat-Pack Bundles ! Orders are usually shipped USPS 1st Class or Priority Mail. Orders received by 10 am Central-Time will normally ship that business day.